The past decade has seen notions of ‘sustainability, ‘responsibility,’ and ‘social impact’ become part of mainstream parlance. Divorced of context, these buzzwords suggest a utopian awareness of our individual roles in an increasingly globalized society. Case in point? Look no further than McDonald’s Healthy Menu, which the fast food behemoth recently told CNN is part of its “food journey,” a phrase that evokes Nag Champa and dog-eared copies of Eat Pray Love. While organic/clean/green culture might insinuate progress, it’s hard not to grow cynical upon closer inspection; there are so many instances of greenwashing and corporate doublespeak that it’s unclear what terms like ‘responsibility’ mean anymore. Still, when it comes to large companies that adopt ethical stances—even those with less-than-stellar track records—it would be remiss for people and organizations with a desire to make change not to at least consider ways to collaborate with the entities that have the most resources, political leverage, and technical expertise. Business schools are a ground zero for this kind of collaboration. A 2013 NY Times piece reported that, “students interested in social business remain a minority of MBA applicants.” Just four years later and it seems like we’re in the midst of a palpable 180 at business school campuses across the country. 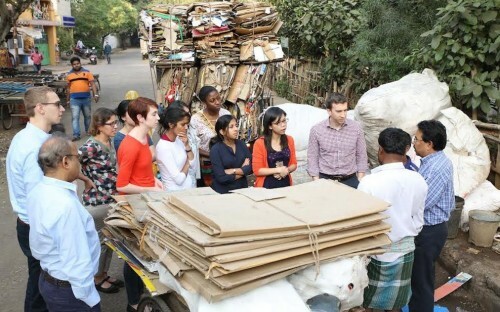 MIT Sloan’s Sustainability Initiative and Social Impact Fellowship are both representative of a campus-wide culture that seeks to meaningfully connect students and graduates to a world beyond the classroom. Since 2006, 435 Berkeley graduates have been placed on nonprofit boards of directors through the Berkeley Board Fellows program. The school’s Global Social Venture Competition has awarded $50,000 in prizes each year to pioneering ideas for social enterprises. Recent examples of CSI projects include establishing charter schools with innovative teaching methods, an initiative using economic incentives to reduce pollution, and a fair trade certification to promote environmental sustainability among farmers. There’s also the Chicago Booth Global Social Impact Practicum (GSIP), a course supported by Indian nonprofit Tata Trusts in which business students consult on real projects in emerging markets related to development, infrastructure, and social enterprise. In addition to Fox’s Board Fellows Program, Fox professors are individually committed to integrating social justice into their curricula. Jean Wilcox, who runs a course in Entrepreneurial Marketing, introduced the 10-10-10 Foundation, challenging students in teams of 10 to take $10 of seed money and multiply it by a factor of 10 to contribute to a non-profit or community organization. Since January 2010, her students have generated more than $320,000 and more than 4,500 volunteer hours. Fox professor Steven Balsam, from the Accounting department, has for the last nine years led thele Volunteer Income Tax Assistance program to help residents of Ambler, Pa., with a household income below $52,000, file their federal and state tax returns free of charge. Balsam and his students helped residents secure more than $437,000 in returns filed in April 2016. There are opportunities outside the classroom for Tuck students to study abroad, serve on the boards of nonprofits, invest for impact as a part of the Tuck Social Venture Fund, or study economic development in rural communities.